Al-SHAHEED SAQAFATI MARKAZ INAUGURATION @SIALKOT. Al-Shaheed Saqafti Markaz is an effort under the propagation department [Shoba-e-Nashr-o-Ashaat] for introducing and strengthening the Islamic culture in our Pakistani society . 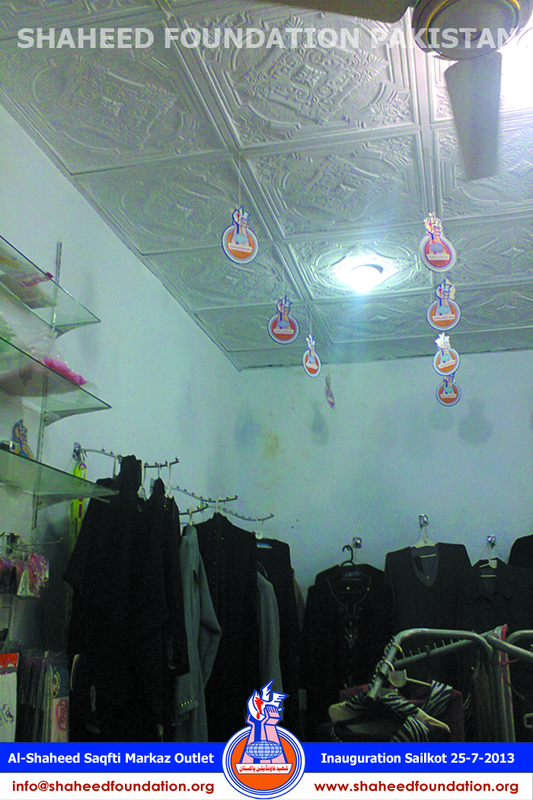 Alhamdulillaah ever since the first outlet of Al-Shaheed Saqafati Markaz was opened annexed to the central office of Shaheed Foundation Pakistan at Block 20 FB area , there was a growing demand and liking for Al-Shaheed products from momineen from different parts of the country as well as from different countries . In Karachi alone ,where there are several strongholds of momineen a need was being felt for reaching out to momineen in different parts of the megapolis . As a first step in that direction ,an outlet of the Al-Shaheed Saqafati Markaz was Alhamdulillaah was inaugurated coinciding with the sacred occassion of the birth anniversary of Ameer-ul-Momineen Hazrat Ali Ibn-e-Abi Talib [AS] on 24th May 2013 . It may not be out of place to mention that the first Markaz which was inaugurated on Eid-e-Mubahila four years back has contributed significantly for increasing the awareness of Islamic fundamentals and creating a 'Shaheed Parwar ' society -something which remains the focal objective of Shaheed Foundation Pakistan. 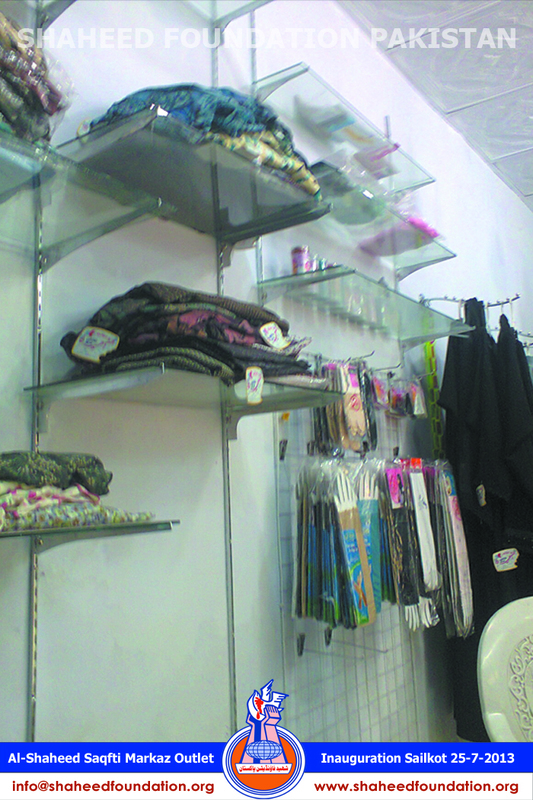 Al-Shaheed products on display include different varieties of headgears,scarves , Chadors,Abayas and Maqnas ,Stockings,Sleeves ,Perfumes [Itar] etc are available on the centre. In another area of Karachi i.e New Rizvia work is steadily going on ,on Markaz-e-Nigehdasht-e -Khanwada-e-Shohada. It is also planned to house another outlet of Al-Shaheed Saqafti Markaz on one of the floors of the project . 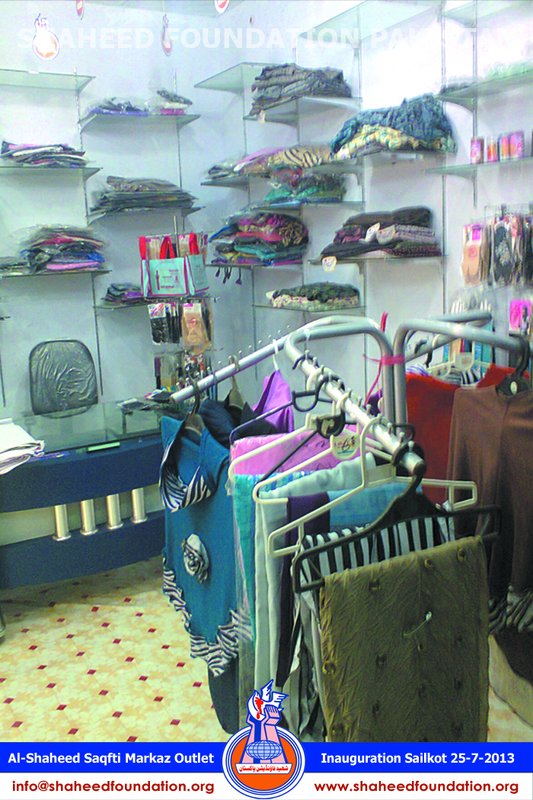 Al-Shaheed Saqafti Markaz serves to showcase and make readily available different items primarily related to Hijab to establish a Shaheed Parwar society by promoting the Islamic culture in the society .Alhamdulillaah within a short period of time the popularity gained by its precedent ,the first Al-Shaheed Saqafati Markaz in Block 20 Ancholi and ever increasing demand from momineen o mominaat for the need of such a markaz in different parts of the country and city encouraged SFP to work towards opening a centre in Soldier Bazar about three months ago. Alhamdulillaah continuing with the same spirit ,another Al-Shaheed Saqafati Markaz is being inaugurated this time in Sialkot ,coinciding with the sacred moments of the birth anniversary of Imam-e-Hasan-e-Mujtaba[AS].
" Hijaab, Shohada ke Khoon se Afzal hai." 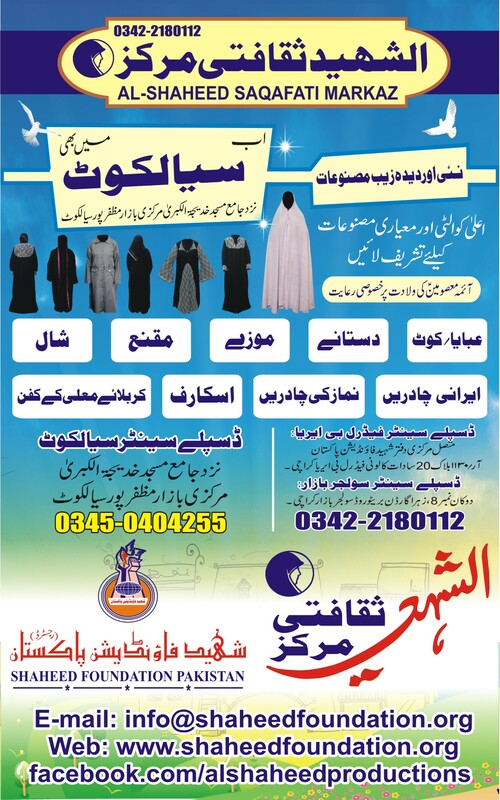 We hope and pray that the centre in Sialkot will also inshaallah successfully contribute immensely to the cause of martyrs and Islam in Pakistan and it goes without saying that the profit earned through such projects directly are invested into well being of our benefactors i.e Shohada-e-Millat-e-Jaffaria Pakistan . We would like to thank Millat-e-Jaffaria Pakistan whose consistent support and trust enables the system to run in this causal world, with the blessings of Imam-e-Zamana[a.t.f.s] .